TEMPE, AZ Arizona State Baseball will begin its quest for its sixth National Championship and 22nd trip to Omaha and the College World Series on February 19th when the Sun Devils host the Northern Illinois Huskies at Winkles Field- Packard Stadium at Brock Ballpark in the 2010 Season Opener. Announced today by head coach Tim Esmay, the 2010 schedule features 35 games at Packard Stadium, including two non-conference match-ups with in-state rival Arizona on April 20 and May 4.
regular season on March 16 and 17 at Goodwin Field in Fullerton. The rest of the non-conference slate features two straight four-game series to open the 2010 season. Northern Illinois opens the year in Tempe from Feb. 19-21, followed by Towson from Feb. 26-28. The SEC’s Auburn Tigers will visit Tempe for a three-game set beginning March 12, and the Houston Cougars will play at Packard Stadium for three games starting March 19. Grand Canyon (March 9), San Diego (April 5-6), San Francisco (April 27-28) and BYU (May 10-11) will also visit Tempe. The leader in West Coast attendance for the past five years, Arizona State will once again enjoy one of the nation’s best home field advantages. Over 125,000 fans came through the turnstiles to watch the Devils play in 2009, as ASU averaged 3,207 fans per home game. Thanks to tremendous fan support that creates an unmatched atmosphere at home, the Sun Devils went 36-4 at home, winning their third consecutive Pac-10 championship and advancing to the College World Series for the third time in five years. For the eighth straight year, Arizona State will travel to Surprise, Ariz., for the Coca-Cola Classic at Surprise Stadium, Spring Training home of the Texas Rangers and Kansas City Royals. The Devils will face 2009 NCAA Tournament participant Cal Poly, who played in the Tempe Regional, on March 4, Pac-10 rival Oregon State in a non-conference match-up on March 5, UC Riverside on March 6, then wrap up the weekend in Surprise against former ASU assistant coach and current Florida International head coach Turtle Thomas and the Golden Panthers on March 7. 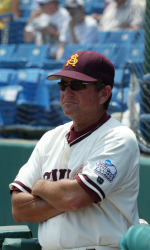 Arizona State will be seeking its 11th straight trip to the NCAA Tournament, which will begin on June 4. Super Regionals will follow from June 11-14 with the college baseball season culminating in the College World Series, beginning June 19 at Johnny Rosenblatt Stadium in Omaha, Nebraska. 2010 marks the final season the College World Series will be played at Rosenblatt Stadium, as the annual championship tournament will move to TD Ameritrade Park in Omaha beginning in 2011.